This functional Kenny's Creek Darwin H55 daughter has a moderate frame and strong IMF figures. 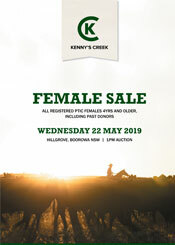 Her dam, Kenny's Creek Blackboom J368 is also in this sale. Sold pregnancy tested in calf to Kenny's Creek Justice M45 with a male fetus.